Has been invited by OFS Technikon, Technikon SA and Vaal Triangle Technikon to serve on their advisory committees. Compiled OFS Battlefield brochure 1992, 1st print 13 000 second print 10 000. Initiated private financing for private Tourism brochure. Initiated Free State Tourist Guide Association and was made honorary member, has also been involved in three short courses. Co-ordinating member for world rugby cup arrangements in the Free State. Involved with new proposed tourism policy for the Free State. 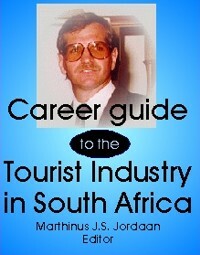 Advises masters and doctoral students re tourism research. Has been on Sertec national panel to evaluate Technikons in South Africa for their infrastructure to offer diplomas and degrees. Was nominated for Bloemfonteiner of the Year 1992. Career guide was offered to be translated into Xhosa. Author of series of radio talks. Involved with tourism negotiations with ANC during 1993 and 1994. Presently serving on the Transgariep Tourism Association Board. Presently serving on the Free State Tourism Marketing Board. Nominated to restructured SATOUR Board 2000.